Loosen outer socket lock nut, and remove outer socket. When loosening lock nut, be sure to fix outer socket with a wrench or an equivalent. Remove boot clamps, and then remove boot from inner socket. Do not damage inner socket part and gear housing part of steering gear assembly when removing boot. 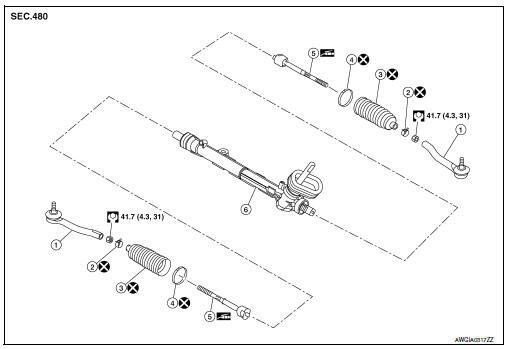 steering gear assembly must be replaced if steering gear assembly are damaged because it may cause foreign material interfusion. Do not reuse boot clamps. Apply recommended grease to inner socket (A) of gear housing assembly, and install boot to gear housing assembly. Use Genuine Lithium Soap, Autorex A (manufactured by Kyodo yushi) or equivalent. Install boot clamp (large diameter) (1) to boot using Tool. Do not reuse boot clamp (large diameter). 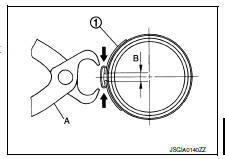 Install boot clamp (large diameter) securely to boot groove, and crimp it so as to have clearance (B) of 3 mm (0.12 in) or less as shown. Install boot clamp (small diameter) to boot. Do not reuse boot clamp (small diameter). 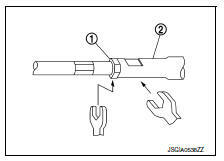 Adjust inner socket to standard length (L), and then tighten outer socket lock nut (1) to the specified torque. Check length again after tightening lock nut. When tightening the outer socket lock nut (1), be sure to fix outer socket (2) with suitable tool to prevent the ball joint from getting contact with the knuckle. Adjust toe-in after this procedure. The length achieved after toe-in adjustment is not necessary the above value.